Move over, Shizuoka tea. Move over, Saitama tea. Here comes Fukushima tea with 24,700 becquerels/kg of radioactive cesium. The tea leaves were picked in Fukushima City in May last year, and they were not commercial tea. A city resident grew in his/her garden and picked for his/her own use. I hope the tea weren't consumed or given as gifts. At 24,700 becquerels/kg, you cannot even dump it in the garbage, let alone incinerate. 24,700 becquerels/kg of radioactive cesium was detected from the tea leaves brought by a city resident to the testing laboratory operated by Fukushima City. The news was reported at the meeting of the disaster response headquarters of Fukushima City on March 22. According to the city, the resident grew the tea in his/her garden. When he/she brought the tea leaves to the testing laboratory, the high levels of radioactive cesium were detected. So the tea leaves were tested again using the germanium semiconductor detector. The tea leaves were picked in May last year, and kept at the resident's house. The city plans to increase the number of detectors and will set up 28 testing laboratories in the city by the end of this month. The environment section of the Fukushima city government cautions the residents, "Produce from the home gardens, depending on the types, may exceed the safety limit [for radioactive cesium]. We would like you to bring them to the testing laboratory by all means." Goshi Hosono's Ministry of the Environment has set up a special website to promote and sell the wide-area disposal of the disaster debris in Iwate and Miyagi Prefectures. In it, there is a page about radiation levels of the debris. The Ministry, which is sounding more and more like a religious ministry preaching safety of disaster debris, says the radiation coming off of the debris once it's burned and buried deep should be no more than 0.01 millisievert per year. On the right side, there is a table showing the radioactivity of the debris in becquerels, without specifying what types of debris. However, below the table, there's a link to the PDF document with far more details, which I reproduced below. The debris from Tagajo City, Miyagi Prefecture that was used in Hosono's propaganda demonstration on the street corner of Kawasaki City the other day was wood chips, which has the least amount of radioactive cesium. If they had picked fabrics, it would have contained 540 becquerels/kg of radioactive cesium, and if they had picked small debris less than 5 millimeters in diameter, it would have been 390 becquerels/kg. (See Page 4 below.) Not that the radioactivity would have been picked up by a survey meter that they were using. That video of politicians demonstrating the "safety" of disaster debris in Kawasaki is really infuriating. Goshi Hosono says "People may be thinking disaster debris from Fukushima is coming to them, hahahahaha" (I'm paraphrasing.) No they don't. They know better than him, much better. Besides, Fukushima disaster debris may be coming out of Fukushima after all. Iwaki City will burn the disaster debris starting April, and Iwaki City had a long standing contract to ship the ashes to Saitama Prefecture where the ashes were burned again in the melting furnace into slag to be recycled as road substrates. The contract was carried out until late last year. That contract may be renewed, and disaster debris from Fukushima, in the form of ashes, may be shipped outside Fukushima. It's also worthwhile to recall that the so-called safety standard of disposal of 8,000 becquerels/kg (for debris, ashes, sludge to be buried without any treatment to the final disposal sites) was originally meant for Fukushima Prefecture alone. Before anyone noticed it, it became the de facto national standard. With the no-entry zone and the planned evacuation zone around Fukushima I Nuclear Power Plant to be renamed, it may not be very long before the debris from Fukushima Prefecture starts to spread (if not already - there have been "baseless rumors"). Minami Soma City, where the recovery and reconstruction road race and marathon is taking place on Sunday March 25 in the area that has higher radiation levels than radiation control areas in a nuclear power plant, will soon be able to welcome the residents back to the no-entry zone and planned evacuation zone. In an effort to reorganize evacuation zones set up after the Fukushima I Nuclear Power Plant accident, the national government submitted its plan to Minami Soma City in Fukushima Prefecture on March 23 that will reorganize the no-entry zone and the planned evacuation zone in the southern and western part of the city into 3 new zones, with most of the area designated as "zone in preparation for having the evacuation order lifted" which would allow residents to return. The rest of the area will be designated as "zone where residents cannot return for a long time" and "zone with restricted entry". The official in charge from the national nuclear disaster local response headquarters disclosed the plan in meeting in the City Hall between the national government and the city. The details of the 3 zones will be given by the national government by the end of March. The city requested that the no-entry zone be abolished by the end of April at the latest. The meeting was closed to the public. The Japanese government, in its never-ending irksome PR effort to appeal normalcy and vigorous recovery of Japan to the whole world, is going to return the residents to the no-entry zone (20-kilometer radius from Fukushima I Nuclear Power Plant) and the planned evacuation zone (mostly between 20 and 30 kilometer radius, including the very high radiation areas like Namie-machi and Iitate-mura) by simply renaming the zones. Again for your reference, pre-Fukushima average annual radiation exposure in Japan was 1.4 millisievert, including both external and internal radiation exposure (food, radon inhalation). This is the average, and eastern Japan had lower radiation exposure than western Japan. In case of Minami Soma City, only a couple of homes in Kodaka District will be designated as the zone where they cannot return for a long time. But everywhere else will be good for the residents to return. Mayor Katsunobu Sakurai, who became world-famous for his Youtube plea for help in March last year insists that the lifting of the no-entry zone designation does not mean there will be no more compensation for the residents. Good luck with that, Mr. Sakurai. Iitate-mura village chief Norio Sugano also eagerly awaits the re-organization of his village, which is entirely within the planned evacuation zone but has managed to keep a commercial business open (Kikuchi Seisakusho that has several factories in Iitate-mura). Sakurai and Sugano have fared relatively well over the past year, having become world-famous as symbols of the nuclear accident, and having been able to retain political power over the residents. On the other hand, Tamotsu Baba, mayor of Namie-machi is dead set against the re-organization, saying there is no plan in place for rebuilding infrastructure. Governor of Kyoto on Disaster Debris: "We May Not Tell Residents"
Governor Keiji Yamada commented during the press conference on March 23 on the wide-area disposal of disaster debris from the March 11, 2011 earthquake and tsunami, and said "If the local authority (accepting the debris) want to proceed without telling the residents, we should oblige", indicating he might proceed with the debris disposal like the Kyoto government had done in 2004 during the bird flu infection when the disposal by incineration was carried out without identifying which facility would do the incineration. About Maizuru City, which has already pledged cooperation in debris disposal, the governor said "We want to carry out the test to prove safety", and said he would visit the city and explain the safety to the city's residents. When politicians like him say "地元" (=locals), they mean the local government and heads of the neighborhood associations. It doesn't mean residents. Maizuru City is located on the coast on the Japan Sea. A beautiful, ancient town with the first evidence of human settlement 10,000 years ago. The current mayor Ryozo Tatami is a medical doctor. Governor of Kyoto Keiji Yamada is a Tokyo University graduate (law) and a former career bureaucrat (today's Ministry of Internal Affairs and Communications). Not that Sankei Shinbun cares. It decidedly do not care, as it has been calling the Fukushima I Nuclear Power Plant accident as "radiation leak", and its editors and columnists routinely excoriate anyone who disagree with the national government policies of spreading contaminated vegetables and contaminated debris. As the title says, it is purely anecdotal, nothing systematically gathered and statistically analyzed. It's from the readers of my Japanese blog and twitter followers in Japan who wrote to me after reading the Asahi AJW article (I translated it into Japanese) that back in 2005 IAEA had proposed the 300-kilometer radius for contaminated food regulation but the Japanese government objected. We relocated to Kansai last year because of our small baby. Vegetables grown in northern Kanto [Tochigi, Ibaraki, Gunma] were on prominent display at a local supermarket last year. The same season this year, all I see is vegetables grown in Kyushu and Shikoku. What was that lineup last year? I live in Kansai. Last year, it was all vegetables grown in Kanto, which I had never seen before. I could hardly find locally grown vegetables. I sent my small child to my parents' house in Osaka. My mother understood the radiation danger and she paid close attention to food. She was very angry, saying "Why are they selling these vegetables from the dangerous [contaminated] areas?" I live in Osaka. Same time last year, the vegetables I saw at the supermarket were all from the high-radiation areas, like cucumbers from Date City, Fukushima. I had never seen any vegetable from Fukushima before. About the same time last year (late March) and onward, there were people in Kansai (Osaka, Hyogo, Kyoto, etc.) reporting that the vegetables at their local supermarkets were all of Kanto origin that they had never even seen before. They were roundly ridiculed, and were accused of fear-mongering, making up stories, or worse, discriminating against Fukushima people. They were called "racists" in a country which is pretty much homogeneous. One year later, the vegetable lineups seem to have gone back to pre-Fukushima normal, i.e. vegetables from western Japan sold in western Japan. Remember all that beef contaminated with radioactive cesium last year? Here's one of the earliest posts on the topic from last year. The Japanese government started encouraging and facilitating the sale or transfer of cattle out of Fukushima before the planned evacuation zone was set in late April, and beef of Fukushima origin was sold in great quantities in locations which had never seen such a surge in sale of Fukushima beef. Remember also the radioactive crushed stones from a stone pit in Namie-machi, right outside the no-entry zone (20-kilometer radius) and inside the planned evacuation zone? The stone pit operator was able to sell (literally) tons of stones far and wide (some were sold and used in Tokyo) before the planned evacuation zone was set in late April. The Japanese government has successfully disseminated contaminated vegetables, beef, crushed stones, and a host of everything else (firewood, used cars, leaf compost, sawdust for shiitake growing, etc.) out of Fukushima and the contaminated areas in northern Kanto. Its success is partly attributable to people who attacked people like these mothers (and fathers) as "fear-mongering", "irrational", "nuclear-crazy" "racists". Right now, a different set of people are called "racists", because they oppose accepting the disaster debris from Miyagi and Iwate and burn it in their towns. the Japanese government looks set to score yet another success. Letting the citizens squabble with each other with "racist" name-calling, while the government promising endless money to those in the local governments and waste disposal industry. People like Ms. Cyndi Lauper and Mr. Paul Blustein provide a good old "external" (international) pressure (or "gaiatsu" in Japanese) for the government to tell the citizens, "See, international celebrities and scholars are saying what we've been telling you." Hong Kong will resume importing the meat and eggs from Fukushima Prefecture and 4 other prefectures in Kanto most affected by the nuclear fallout. Why? Because there will be an official government piece of paper accompanying the meat, attesting the safety from radiation contamination. Bureaucrats will be bureaucrats, whether it's Japan or Hong Kong. Formality is all that matters. Export of meat and eggs to Hong Kong from 5 prefectures including Fukushima will resume shortly. The export was halted after the Fukushima I Nuclear Power Plant accident. Minister of Agriculture Kano disclosed the news during the press conference after the cabinet meeting on March 23. The format of the inspection certificate has been agreed upon, and the export will resume in about one week. Hong Kong is the largest market for Japanese agricultural and marine products. In 2011, the amount was 111.1 billion yen, one-quarter of the total export. Resumption of export to Hong Kong may affect the decision by China, who has halted import from Japan for the same reason. Hong Kong had demanded that the Japanese government issue inspection certificates as a condition to resume import of eggs and meat from Fukushima, Gunma, Tochigi, Ibaraki, and Chiba. Up till now, the officials couldn't agree on what to put on the certificates, which prevented the restart of the trade. Hong Kong, Taiwan, China are big importers of Japanese produce, which (used to) fetch premium for the look, taste, and safety. As Chugoku Shinbun reports (3/24/2012) on the meeting between the Shimane Prefecture officials and the Ministry of the Environment, as long as money from the national government is coming to them the local governments will stop worrying. Why is the Shimane prefectural government pressuring the municipalities in Shimane to accept disaster debris? The prefectural government doesn't want to miss out on the gravy train, but it has to beg the municipalities probably because the prefectural government does not have the incineration plant of its own. I just wish I had visited this ancient place (I always wanted to visit). Shimane Prefecture held a meeting designed for the municipalities in Shimane regarding the disposal of disaster debris from the March 11, 2011 earthquake and tsunami, by inviting the official from the Ministry of the Environment. Shimane was the first prefecture to hold such a meeting in the 5 prefectures in Chugoku Region. In the meeting, the safety standard of 8,000 becquerels/kg of radioactive cesium in the ashes from burning the debris as well as the national government's policy to pay for the entire cost of disposal were emphasized to the participants. Tsuyoshi Sekiya, head of the wide-area disposal promotion team at the Ministry of the Environment recycling division explained to 35 officials from 19 municipalities and 3 wide-area waste management unions. The disaster debris from Miyagi and Iwate to be disposed outside the prefectures was 3.44 million tonnes from Miyagi and 570,000 tonnes from Iwate, Sekiya said, and requested that they consider accepting the debris because "there is not enough capacity" in the disaster-affected areas. Officials from the municipalities asked about the details of measures that Prime Minister Yoshihiko Noda indicated in early March to support wide-area disposal of the debris, including financial support from the national government for radiation measurement of the disaster debris. Sekiya could only say, "As soon as possible". In Shimane Prefecture, the City Assembly in Matsue City [capital city] is expected to pass the resolution requesting the city to accept the debris. Shoji Kodama, manager of Matsue City's environmental protection section who attended the meeting said, "Securing the safety of the residents comes first, and we will discuss." 4 million tonnes of disaster debris from the two prefectures, less than 20% of the total debris. How will Mr. Kodama of Shimane City secure the safety of the residents? Probably by doing what Hosono and his clowns did the other day on the street corner in Kawasaki City, Kanagawa. Wave a survey meter over the debris and scream "See? Did you see that? It's safe!" One good thing about the article by Chugoku Shinbun is that the reporter named names. That seldom happens in the national newspapers, particularly online versions of their papers. It's always "an unnamed official" or "the government source". If you thought the women's "ekiden" road race that took place in Fukushima City last year was bad, you haven't seen this thing. Minami Soma City, where one of the "black dusts" found on the road surfaces throughout the city has 3.43 million becquerels/kg of radioactive cesium (and who knows what else), will hold a marathon and "ekiden" road race in the city to show to the world the recovery and reconstruction of Minami Soma City. Unlike the women's road race in Fukushima City where the youngest girls who could enter the race were 13-year olds, the Minami Soma marathon event will have elementary school kids running the 2-kilometer course. The entity who has organized this event, an NPO called Furusato Fukko [homeland recovery] Kizuna [ties that bind domestic animals] Council, will let elementary school children and junior high school students participate for free. How generous. Everybody else will pay 3,000 yen (US$36) to kick up dusts that may have several million becquerels/kg of radioactive cesium. The Minami Soma Furusato [homeland] Recovery Ekiden and Marathon will be held on March 25, with the starting and ending point at the Kashima Country Club in Kashima District of Minami Soma City. People can sign up up till March 10. The event is sponsored by an NPO, Furusato Fukko [homeland recovery] Kizuna Council and the event executive committee (chairman Nobuyoshi Sato). 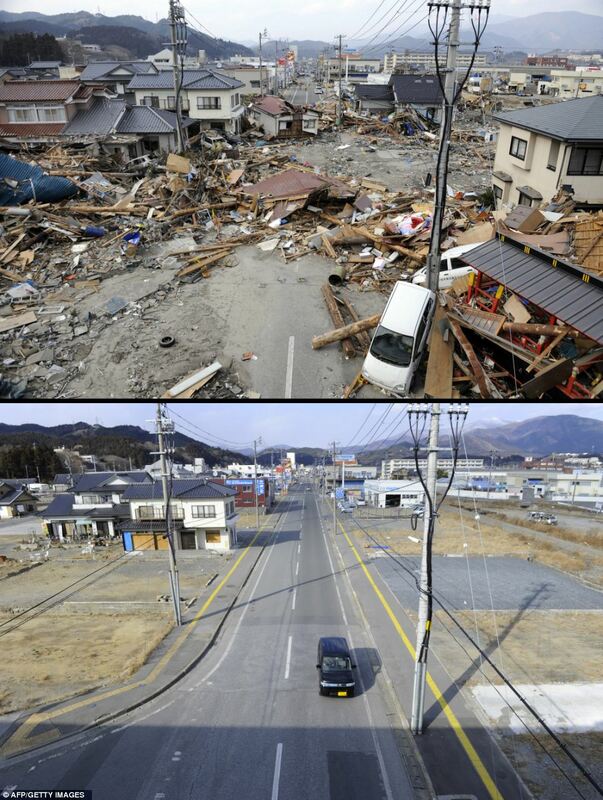 Minami Soma City has been deeply affected by the earthquake/tsunami and the nuclear accident. The event will feature the local residents run with vigor to cheer and encourage the residents who have evacuated or live in the temporary housing. The event is subsidized by the Fukushima prefectural government as a community-building and -supporting event. The marathon and ekiden road race will start and end at the club house of the Country Club. Elementary school children will run a 2-kilometer marathon, junior high school students 3-kilometer, high school students and general public 5-kilometer or 10-kilometer. An ekiden road race team will consist of 4 people, with each running 1.5 kilometer. For more, contact Furusato Fukko Ekiden/Marathon event office at 03-5379-3700. Now that's very interesting. That telephone number is a Tokyo number, not Minami Soma. The NPO's announcement shows it is located in Shinjuku-ku, Tokyo. The chairman of the Council is Nobuyoshi Sato. No idea who this man is, but he has successfully obtained the government money (who will then take money from the taxpayers) to plan an event where elementary school children are encouraged to run in a city with on-going "decontamination" effort right outside the 20-kilometer no-entry zone in Fukushima. The event subtitle is "Fukushima-51". It will send vigor and courage for the next millennium with courageous dream from Kashima Country Club. Fukushima-50 (whom the world praised) plus 1. "1" signifies the future of courageous children, region, and Japan, and by broadcasting the event to the entire world showing the local people running toward the recovery, we will thank people from all over the world who have helped us. It will evoke the image of powerful and proud Japan, and will inspire courage and confidence in the recovery of the region. So we will hold this event. By the way, the parents of these children (under the age of 18) must sign the waiver for them that will indemnify the organizer from any injury and sickness on the day of the event and afterwards. If you see school kids running in this event, there are parents in that city who will have signed the waiver. So much for "We have to protect children" refrain you hear all over Japan. The waiver document also says the air radiation levels at the Kajima Country Club are 0.6 to 0.7 microsievert/hour. HCR+OPCOM, a Minami-Soma-based NGO who protested the Fukushima City's women's road race, was doing a hunger strike in front of the Kajima Country Club protesting against the event that would endanger children for no good reason other than to show that people in Minami Soma are brave. When Quince the robot entered the reactor building to measure the radiation levels on the 1st floor of Reactor 2 building, the radiation levels were in 2 digits. Now, carbon-based colleagues of Quince (TEPCO and Toshiba) entered the same building, and they got to detect 1,640 millisieverts/hour (or 1.64 sievert/hour) radiation on the second floor. TEPCO and Toshiba employees entered the Reactor 2 building to conduct the survey in preparation for installing the thermometers to replace the current ones that are failing fast. The survey was done on March 15, 16, 21 (this may be Quince only), and 22. The Ministry of the Environment, whose mandate also includes protection of animals, says "There is no effect on humans" if one stays away far enough. What about the birds, having grown up in a nest with 1.4 million becquerels/kg of radioactive cesium with 2.6 microsieverts/hour surface radiation? The Ministry of the Environment announced on March 23 that 1.4 million becquerels/kg of radioactive cesium (Cs-134 and Cs-137) was detected from a swallow's nest taken from the wall of a building in Okuma-machi in Fukushima Prefecture, about 3 kilometer from Fukushima I Nuclear Power Plant. According to the Ministry, the nest was built from the mud from a nearby rice paddy and dead leaves with high radioactive cesium density. The nest was taken to the National Institute of Radiological Sciences (in Chiba City, Chiba), where the radiation levels were measured. It was 2.6 microsieverts/hour on the surface of the nest, but the radiation level dropped off to 0.08 microsievert/hour at 50 centimeters from the nest. The Ministry says that "if one stays away from the nest, it can be safely concluded that any health effect on humans can be ignored". I can't find any press release on the subject at the Ministry of the Environment website, which is a disorganized mess (probably on purpose). The Yamashina Institute for Ornithology announced last year that it would collect swallows' nests from various locations in Japan to test for radioactive materials. I wonder if they had done it. I would trust the institute much more than the Ministry of the Environment. Looking at their website, they are still collecting the nests from 2011. Not a problem, says the city. The debris from the natural disaster (earthquake, tsunami) was doused with radioactive fallout from Fukushima I Nuclear Power Plant. As I wrote earlier today, plutonium isotopes were found in Iwaki City on a metal plate that had been outside since March 11, 2011, and they were of Fukushima I Nuke Plant origin. But the city will start burning in earnest in April so that the city is debris-free by the end of 2013. The residents of the city don't seem totally on board, but just like Tokyo's governor and Shimada City's mayor, the Iwaki City's unnamed officials (in the article below) say the city will do it anyway. Iwaki City will burn the disaster debris in earnest, "Radiation level is not a problem"
Iwaki City has decided to start the burning of the disaster debris from the March 11, 2011 earthquake/tsunami in the fiscal 2012 [that starts on April 1]. The city conducted the test burn in February, and decided there was no problem with the radiation level. After explaining to the local residents, the city will start burning the debris in the city's two waste disposal plants in April. Iwaki City has about 40,000 tonnes of disaster debris that needs incineration. If the incineration starts in earnest, the debris will be disposed of completely in the fiscal 2013, according to the city. The test burn was conducted from February 16 to 22 at the Nanbu waste disposal center. Disaster debris was mixed with the regular household garbage at 8.8%, and 860 tonnes of this mixed waste was burned. Radiation levels of exhaust gas, fly ashes, and main ashes were measured, and the air radiation levels inside the compound and in the surrounding levels were measured. The levels were not significantly higher than when only the household garbage was burned. The results of the measurements are published on the city's website. So far, because of the opposition from the residents, the disaster debris in the city hasn't been burned in earnest. The person in charge at the city government says, "Unless we burn, daily lives of the citizens will be negatively impacted. It may be difficult to obtain the unanimous consent from the residents, but ultimately we will carry out [the burn], and the city will take responsibility." Well if that's the case, what is your name, Mr. Anonymous at the Iwaki municipal government in charge of contaminated debris burning? As of February 2012, 8,500 becquerels/kg of radioactive cesium was still found in the fly ashes at the incineration plants in the city, and that was just household garbage. Scientific American: "Effective World Government Will Be Needed to Stave Off Climate Catastrophe"
Almost six years ago, I was the editor of a single-topic issue on energy for Scientific American that included an article by Princeton University’s Robert Socolow that set out a well-reasoned plan for how to keep atmospheric carbon dioxide concentrations below a planet-livable threshold of 560 ppm. The issue came replete with technical solutions that ranged from a hydrogen economy to space-based solar. If I had it to do over, I’d approach the issue planning differently, my fellow editors permitting. I would scale back on the nuclear fusion and clean coal, instead devoting at least half of the available space for feature articles on psychology, sociology, economics and political science. Since doing that issue, I’ve come to the conclusion that the technical details are the easy part. It’s the social engineering that’s the killer. Moon shots and Manhattan Projects are child’s play compared to needed changes in the way we behave. The report summarized 10 years of research evaluating the capability of international institutions to deal with climate and other environmental issues, an assessment that found existing capabilities to effect change sorely lacking. The authors called for a “constitutional moment” at the upcoming 2012 U.N. Conference on Sustainable Development in Rio in June to reform world politics and government. Among the proposals: a call to replace the largely ineffective U.N. Commission on Sustainable Development with a council that reports to the U.N. General Assembly, at attempt to better handle emerging issues related to water, climate, energy and food security. The report advocates a similar revamping of other international environmental institutions. Unfortunately, far more is needed. To be effective, a new set of institutions would have to be imbued with heavy-handed, transnational enforcement powers. There would have to be consideration of some way of embracing head-in-the-cloud answers to social problems that are usually dismissed by policymakers as academic naivete. In principle, species-wide alteration in basic human behaviors would be a sine qua non, but that kind of pronouncement also profoundly strains credibility in the chaos of the political sphere. Some of the things that would need to be contemplated: How do we overcome our hard-wired tendency to “discount” the future: valuing what we have today more than what we might receive tomorrow? Would any institution be capable of instilling a permanent crisis mentality lasting decades, if not centuries? How do we create new institutions with enforcement powers way beyond the current mandate of the U.N.? Could we ensure against a malevolent dictator who might abuse the power of such organizations? Behavioral economics and other forward-looking disciplines in the social sciences try to grapple with weighty questions. But they have never taken on a challenge of this scale, recruiting all seven billion of us to act in unison. The ability to sustain change globally across the entire human population over periods far beyond anything ever attempted would appear to push the relevant objectives well beyond the realm of the attainable. If we are ever to cope with climate change in any fundamental way, radical solutions on the social side are where we must focus, though. The relative efficiency of the next generation of solar cells is trivial by comparison. Brave new world. Instilling a permanent crisis mentality lasting centuries. The video was taken on March 21, 2012 and released by TEPCO on the next day. The images are much clearer, even though the ROV still has air bubbles inside. There is also a short video (20 seconds) that shows part of the SFP liner, which looks OK. It was originally reported on a blog called "Alpha rays and metal plate (α線と鉄板)" on March 18, 2012. Here's the result of the analysis. Frankly, I am surprised that plutonium was detected. Plutonium has been spread and deposited at low densities in wide areas because of the atmospheric testing of nuclear weapons . The ratio of plutonium isotopes, Pu238/Pu239+240, of the atmospheric testing origin is about 0.03. But this time [dusts off the metal plate in Iwaki City], this ratio is higher at 0.8, indicating the dusts contain plutonium of the Fukushima I Nuke Plant origin. The government estimate of the ratio of these plutonium isotopes is 3. Considering the plutonium of the atmospheric testing origin is not attached to the metal plate, I wonder why the ratio is lower than the government estimate. It is possible that not all plutonium isotopes released had the ratio of 3, and there were plutonium isotopes with the lower ratio (0.8) that were released from the plant. Further, the ratio of Pu239+240/Cs-137 is 9.0E-5, which is 200 times the government estimate of 4.3E-7, showing more plutonium being detected than the government estimate indicates. It is probably because of fractionation. Right now, I am hoping to test for uranium, and Am-241 if possible. I am asking Professor Yamamoto to confirm that this is his analysis report. Tokyo Shinbun has another incredible, unbelievable report on how the Japanese government worked (or rather, didn't work) during the first 5 days of the Fukushima I Nuclear Power Plant accident that started on March 11, 2011. You've read about Fukushima Prefecture deleting the emails that had SPEEDI simulation graphics earlier. Now you're about to learn about the Off-Site Centers. The Off-Site Centers are located near the nuclear power plants, usually within 10 kilometers from a nuclear power plant. There are 16 of them in Japan, and in case of a nuclear emergency these Off-Site Centers act as the local headquarters for nuclear disaster response. Fukushima I Nuclear Power Plant had one, 5 kilometers west of the plant in Okuma-machi. The officials and the staff who manned the Off-Site Center in Okuma-machi fled the Center on March 15 as the radiation levels shot up to 1 millisievert/hour, leaving the mayors of towns and cities in the affected areas to fend for themselves without any actionable information from the Off-Site Center. Not only that. 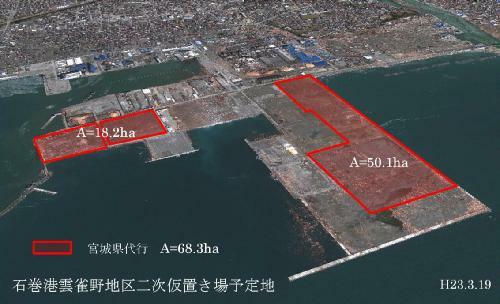 The Tokyo Shinbun article says the Okuma-machi Off-Site Center didn't even have a map that covered the areas outside the 10-kilometer radius from the plant. The Nuclear and Industrial Safety Agency doesn't have a plan to fit the Centers with maps that show outside the 10-kilometer radius, because no formal decision has been made to revise the nuclear emergency zoning. Bureaucrats remain bureaucrats, no matter what. Particularly the Japanese variety. Not even the worst nuclear accident is likely to change them. There are still no detailed maps that show the areas outside the 10-kilometers from the nuclear power plants at the nation's 16 Off-Site Center (OFC) which will act as the local headquarters in case of a nuclear accident. In the Fukushima I Nuclear Power Plant accident, the evacuation zone was expanded to the 20-kilometer radius on the 2nd day of the accident. But since there was no map, [the officials at the center] took too long to determine which residents to evacuate. Drastic changes are necessary for the Off-Site Centers including the locations of the Centers that are too close to the nuclear power plants. But one year since the accident, they still don't even have decent maps. Shinichi Kuroki of the Nuclear and Industrial Safety Agency under the Ministry of Economy, Trade and Industry looks back on the early days of the accident. ""There is no map!" we panicked. Someone finally found a map somewhere, and started to draw lines on the map." Kuroki was at the Off-Site Center in Fukushima on March 12 last year when a hydrogen explosion blew up the reactor building of Reactor 1 and the evacuation zone was expanded from the 10-kilometer radius to the 20-kilometer radius. The current system designates the area inside the 8 to 10 kilometer radius from a nuclear power plant as Emergency Planning Zone (EPZ), and the evacuation plan for the area should be in place. However, the real nuclear accident affected much wider areas. Even when they wanted to instruct the municipalities about the expansion of the evacuation zone to the areas inside the 20-kilometer radius, the evacuation plan and the detailed map were only for the areas inside 10-kilometer radius. Since they didn't have the map [outside the 10-kilometer radius], it took too long to accurately assign the districts for evacuation. In its interim report, the accident investigation commission set up by the government (the cabinet office) harshly criticizes the officials at the Off-Site Center. "People in charge of evacuating the residents could not identify the areas to evacuate, and they couldn't answer the inquiries from the affected municipalities." Based on this lesson, one expert committee in the Nuclear Safety Commission has decided to designate the areas inside the 5-kilometer radius as Precautionary Action Zone (PAZ), and the areas inside the 30-kilometer radius as Urgent Protective Action Planning Zone (UPZ) where the residents would evacuate depending on the levels of radiation. Six years ago, NISA pressured the Nuclear Safety Commission to forgo the expansion of these zones. But the plan to equip the Off-Site Centers with the maps [that covers wider areas] is going very slow. To our inquiry, the person in charge at NISA said, "We haven't checked individual Centers, but there are no maps outside the EPZs." He said it was because a new guideline for disaster prevention hadn't been formally approved yet, and that they would wait and see how the discussion would go before deciding which areas the maps should cover. Currently, there are only two reactors operating in Japan. But even when the reactors are stopped, there is a possibility of a severe accident like Reactor 4 at Fukushima I Nuke Plant if the cooling systems fail. If a nuclear reactor fails again in Japan, the bureaucrats in the national government will continue to split hairs, playing Sir Humphrey. No doubt about it. Goshi Hosono and his increasingly powerful (= a lot of money) ministry appeal to your emotions to take 33 kilograms of disaster debris per person. What would you say? Ordinary citizens all over Japan who oppose bringing the debris into their midst to be burned are armed with data and logic. They're not talking the same language. But luckily for Hosono and the Ministry of the Environment, what counts is the unthinking majority. And some punks like the youthful-looking mayor of Osaka openly say you have to obey the government in a democracy once the government make it a rule or law with either the majority's consent or their lack of dissent. First Solar is the company. The subsidy came from the Export-Import Bank, which President Obama and Harry Reid are currently fighting to extend and expand. The underlying issue is how Obama's insistence on green-energy subsidies and export subsidies manifests itself as rank corporate welfare. Here's the road of subsidies these solar panels followed from Perrysburg, Ohio, to St. Clair, Ontario. First Solar spokesman Alan Bernheimer defended this maneuver, saying this really was an export, pointing out that First Solar paid sales taxes on the transaction. But this subsidy undermines the arguments for Ex-Im's existence. Ex-Im, whose authorization expires May 31, is supposed to be a job creator, helping U.S. manufacturers beat foreign manufacturers by having U.S. taxpayers backstop the financing. "It is critical that we encourage more American companies to compete in the global marketplace," Ex-Im Chairman Fred Hochberg said about the First Solar deal, saying the subsidy "will boost Ohio's economy, create hundreds of local jobs and move us closer to President Obama's goal of doubling U.S. exports by the end of 2014." The implication here is that First Solar was "competing" with foreign solar panel makers in order to sell solar panels -- to First Solar. This isn't the first time Ex-Im has subsidized companies selling to themselves. In late 2000, for instance, the ill-fated power giant Enron won a $132 million direct-loan package from Ex-Im (that is, from the taxpayers) in order to sell "engineering services & process equipment" to a Venezuelan power company owned 49.25 percent by Enron. Enron was both the buyer and the seller in a 1995 sale to Turkey that Ex-Im financed through a $250 million loan. Enron's healthy feedings at Ex-Im's trough before its bankruptcy also help poke holes in another Ex-Im defense: that it operates at no cost to taxpayers. Sure, as long as the foreign buyer pays off the debt, then Ex-Im's loans and guarantees don't increase the deficit. But Fannie Mae and Freddie Mac were profitable for years, too, before they failed and taxpayers had to bail them out. Once foreign governments and foreign companies start defaulting, taxpayers pick up the tab. At least one Enron deal resulted in U.S. taxpayers contributing to the Enron bankruptcy fund. Also, Ex-Im has ended up owning a 747 after Air Nauru failed to make its payments because the island nation's economy -- dependent on seagull droppings -- went under. This week, First Solar unloaded its St. Clair solar farm to NextEra Energy, and so First Solar's financial troubles don't threaten to put the taxpayer on the hook for this deal. But the Ex-Im subsidy itself was a great case in point as to how national industrial policy pitched in the name of helping the U.S. economy often does nothing to help the broader economy, instead helping only those companies lucky -- or politically connected -- enough to get the handouts. Obama, Reid and most of the Republican leadership want to reauthorize Ex-Im this month and boost the amount of debt it can have outstanding. The lobbyists at Boeing, the Chamber of Commerce and the National Association of Manufacturers agree. They'll claim Ex-Im is crucial to prosperity. And for a few companies, it is. First Solar (ticker symbol FSLR) was a darling of Wall Street until about the beginning of last year. The stock's all-time high was in mid 2008 when it hit above $300 a share. By January 2011 the share price had dropped to about $150. Then, a tumble below $100 started in September 2011, and the share now trades at $26, less than one-tenth of the all-time high. Tokyo Shinbun: "#Fukushima Prefecture Deleted SPEEDI Emails"
Tokyo Shinbun reports that an unnamed official in the Fukushima prefectural government deleted emails that were received between March 11 and March 15, 2011 which contained SPEEDI simulations. The emails were taking up too much space in the computer. The excuses may have been somewhat believable in the early 1990s. I guess it is possible that the Fukushima prefectural government is still using Windows 3.1 on a stand-alone PC, dial-up internet connection, and a hard disk with a few megabyte storage. If not, it is amazing the official got away with what he said. The Fukushima prefectural government had the dispersion simulation data of radioactive materials from the Fukushima I Nuclear Power Plant accident from the evening of March 11, 2011 in emails, but lost the data up to the morning of March 15, 2011, our reporter has uncovered by speaking with the people involved. There were explosions at Reactors 1, 3 and 4 during those 5 days, but the prefectural government hasn't shown the simulation data to the municipalities around the plant. The person in charge at the prefectural government says, "The data took up too much space so I deleted it." The Nuclear Safety Technology Center in Tokyo is commissioned by the Ministry of Education and Science to operate the SPEEDI system which predicts the dispersion of radioactive materials. According to the Center, upon being instructed by the Ministry of Education, it started the simulation on the day of the disaster at 4:40PM on March 11, 2011 with the assumption that radioactive iodine was being released at 1 becquerel per hour rate from Fukushima I Nuclear Power Plant. The Center sent the simulation data every hour to the Ministry of Education and Nuclear and Industrial Safety Agency at the Ministry of Economy, Trade and Industry. The data was to be sent to the Off-Site Center in Okuma-machi in Fukushima and to the Fukushima prefectural government, but the dedicated lines were destroyed in the earthquake/tsunami and the Center couldn't send the data. However, they found out they could send the data via email. 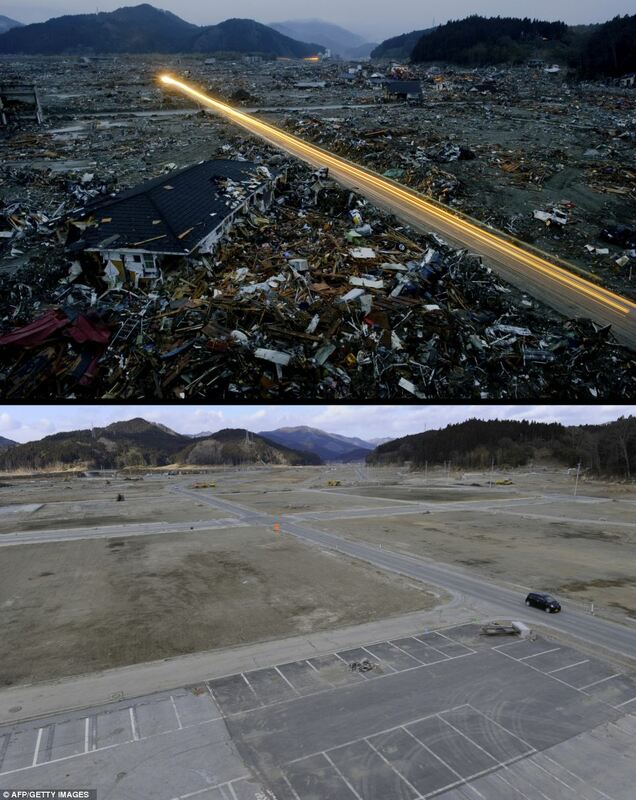 Late that night on March 11, 2011, upon request from the Environmental Radioactivity Monitoring Center of Fukushima located next to the Off-Site Center, the Nuclear Safety Technology Center sent the graphic images of the dispersion simulation. The Center started sending the data to the Disaster Response Headquarters of Fukushima Prefecture in the middle of night on March 12, and kept sending them hourly updates. However, the person in charge at the Fukushima prefectural government says he didn't notice the emails until the morning of March 15, 2011, and that he deleted the emails. The Fukushima prefectural government decided "the simulation is of no use", and never publish the data sent nor notified the municipalities. Separately, the prefectural government received the dispersion simulation by fax from the Nuclear and Industrial Safety Agency at about 10:30AM on March 13, 2011. Since the data was from March 12 to the early morning of March 13, the prefectural government did not publish the data as "past data and not accurate". The official in charge explained, "The data was for the 20-kilometer radius, and the residents inside the radius had already evacuated. The data should have been published by the national government. But as the result [of our withholding the data] the residents were exposed to radiation, and that is true. We should have let them know sooner." In addition to the SPEEDI simulation from the Ministry of Education, Fukushima Prefecture also had in their possession the simulation from the Nuclear and Industrial Safety Agency, and the simulation from TEPCO via fax. The prefectural government of Fukushima chose to sit on all of them, and started complaining about lack of information out loud. It is equally unbelievable that the official in charge continues to work in the Fukushima prefectural government, instead of being thrown in jail. Well I keep forgetting that Prime Minister Yoshihiko Noda has preemptively exonerated anyone from any blame or responsibility when it comes to the Fukushima nuclear accident. It's hard for me to believe that Fukushima Prefecture didn't know about the emails that contained SPEEDI data. Tellurium-132 was detected in Namie-machi, Okuma-machi, and Minami Soma City from early morning till early afternoon of March 12, 2011, well before TEPCO attempted the vent and Reactor 1 had an explosion (Asahi Shinbun, 6/3/2011). The entity that measured tellurium, I think, was Fukushima Prefecture. If they were in the dark as they claim, what were they doing in the early morning of March 11, 2011, collecting dusts to test for radioactive materials? Remember the "performance" by politicians (then-Prime Minister Kan, for one) in spring and early summer last year of eating "delicious and safe" fruits and vegetables from Fukushima? Many celebrities and TV personalities joined in, putting pressure on people to eat Fukushima produce. This year, the spring performance by politicians is to measure the radiation dose of disaster debris on the street corner to convince citizens that "disaster debris is just as contaminated as air in your city". The event captured by Iwakami Yasumi's IWJ live was in Kawasaki City on March 18, 2012. The mayor of Kawasaki City, Kanagawa Prefecture who stands to the right of Hosono in the video is originally from Fukushima Prefecture. As soon as April last year, he declared that his city would accept debris from FUKUSHIMA and burn it in the city to help Fukushima recover. That's how one of the earliest anti-disaster debris movement started in Kawasaki, by alarmed residents there. For more about this former career bureaucrat mayor, see my post from 2/20/2012. Watching this video, I felt sick. These politicians, with Minister of the Environment Goshi Hosono in the middle, just act according to the script as the residents keep heckling them -"What's the point of measuring air radiation dose?" "If you burn it, radioactive materials will get concentrated!" The one with the microphone in the beginning is, I think, the No.3 guy in the Ministry who said "No one trusts the government data". Here he is, shouting into the microphone peddling the government data. The Ministry of the Environment wants to push disaster debris contaminated with radioactive materials (240 to 480 becquerels/kg of radioactive cesium, no other nuclides measured). By this bizarre demonstration, the ministry is trying to tell the residents that the survey meter that measures air radiation levels can detect 240 becquerels/kg of radioactive cesium which they consider "safe" in post-Fukushima surrealistic Japan. 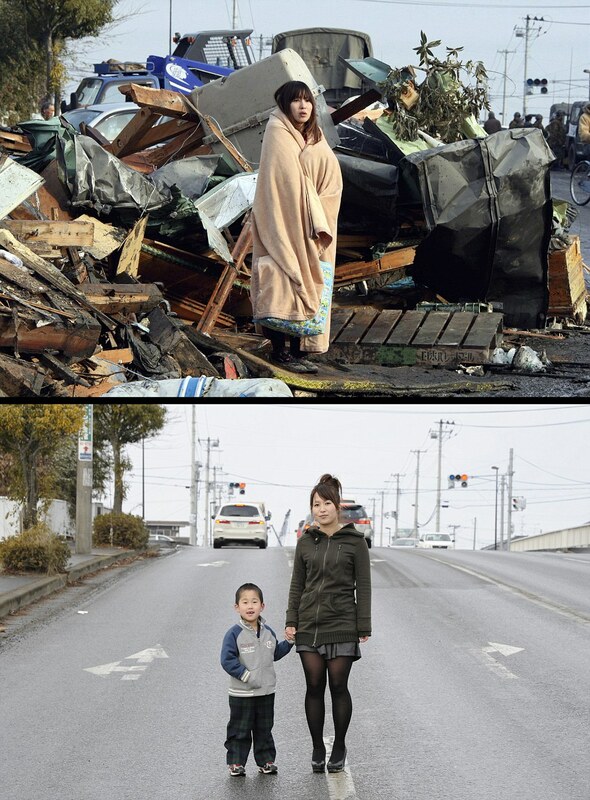 These photos will never ever appear in the Japanese media, because they are so inconvenient for TPTB (the power that be) - whether it is the Ministry of the Environment and the Japanese government or the increasingly powerful waste disposal industry lobby. 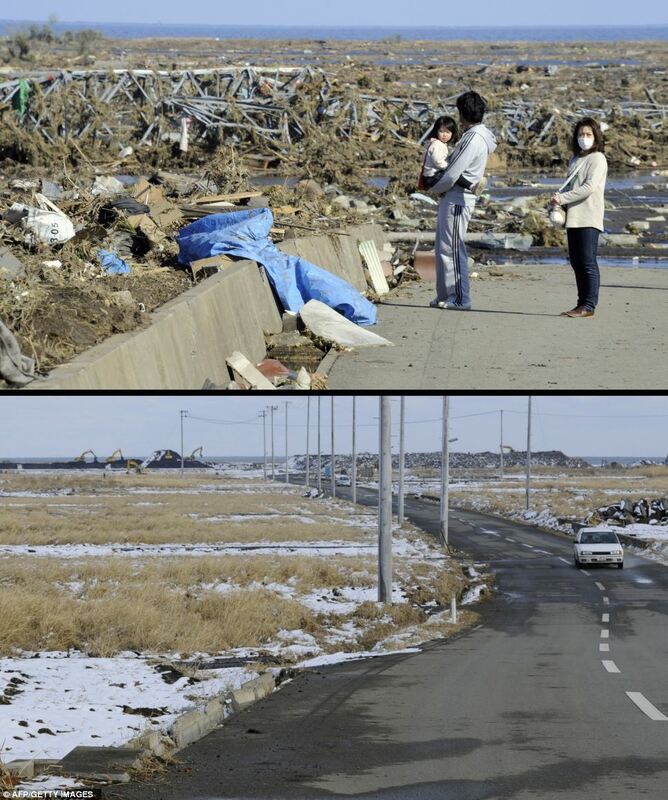 What TPTB in Japan want to portray is the "Before the clean-up" photos of Tohoku. "See, people are surrounded by disaster debris which makes them sad..."
It is sad to see people's lives having been wiped out along with their houses and all the possessions. For more photos, go to Daily Mail page. Mayor of Shimada City Copies Goshi Hosono: "No Baseless Rumors if Disaster Debris is Spread All Over Japan"
Just as Goshi Hosono as Minister of the Environment (he is still the minister in charge of the nuclear accident) said the other day, the mayor of Shimada City in Shizuoka Prefecture is confident that "baseless rumors" will disappear once the disaster debris is spread all over Japan. What kind of "baseless rumors"? In case of Shimada City, it's a "baseless rumor" that the green tea grown in Shimada City may get contaminated with radioactive materials from burning of the disaster debris contaminated with radioactive fallout from the Fukushima I Nuke Plant accident and from burying the ashes in the final disposal site that has dubious records for safety. The mayor has told the city residents who oppose the debris burning to take a hike, saying he will do whatever he wants to do anyway. The city's state-of-the-art melting furnace needs "fuel", and that will be the disaster debris. The waste disposal company president turned mayor of Shimada even worries about the mental health of the residents in the disaster affected area, in the article below. No word about the mental health of the residents of his own city. Mayor Sakurai of Shimada City, Shizuoka who decided to accept disaster debris in Iwate Prefecture met with Governor Tasso of Iwate Prefecture on March 19. He told the governor that he wants to increase the amount of debris per shipment to expedite the debris removal at the disaster affected areas. Mayor Sakurai of Shimada City, Shizuoka Prefecture, who decided last week to accept disaster debris in Iwate Prefecture, met with Governor Tasso of Iwate and Minister Hosono on March 19 at the Ministry of the Environment, and said "I want to do as much as I can" to accept disaster debris. Shimada City is to accept 5,000 tonnes of debris per year, but Mayor Sakurai expressed interest in increasing the amount of debris per shipment. He said removing the debris from the disaster affected areas as soon as possible would improve the mental health of the residents in the disaster affected areas. Mayor Sakurai also touched upon the "baseless rumors" causing damage to the green tea industry in Shimada City because of [his decision] to accept [and burn] the debris. "If disaster debris are accepted in various parts of Japan, there will be no baseless rumors", he said, highlighting the need for tackling the disaster debris disposal on the national scale. As far as the Ministry of the Environment is concerned, it looks like the "escalation of commitment". As early as March 14, 2011, the ministry was sending out a letter to the national waste disposal industry association asking for cooperation in wide-area disposal of disaster debris. It was followed up by another letter, this time to the governors, on April 8, 2011 asking for cooperation. At that time, there was no mention of "radioactive contamination", and no mention of specific prefectures affected by the disaster. This is strange, as disaster debris from the Kobe earthquake was never distributed far and wide, and Hyogo Prefecture (where Kobe is located) did almost all disposal by itself. Oh I get it. The ministry and the waste disposal industry lobby didn't want to repeat the "mistake" of disaster debris distributed all over Japan with fat subsidies to benefit the industry, so they moved very, very quickly, even as the radioactive fallout from Fukushima I Nuclear Power Plant was descending on the debris. By the way, Governor Tasso of Iwate Prefecture is a graduate of Tokyo University (law) and a former career bureaucrat in the Finance Ministry. All too familiar story these days, of ex-bureaucrat governors and mayors eager to help the national government, sometimes with the help of vice mayors who are bureaucrats in the ministries on leave. The earthquake was 17.5 kilometers deep (for more, go to USGS). Damage unknown. There was a M.5.1 aftershock about 30 minutes later. MEXICO CITY (CBS Houston) – A magnitude 7.6 earthquake has struck near Acapulco, Mexico, a favorite tourist destination. The United States Geological Survey reports that the quake’s epicenter was 11 miles underground and 115 miles from Acapulco, in the Oaxaca region, where President Obama’s 13-year-old daughter Malia is reportedly staying for spring break. “You can definitely have some pretty significant damage for the region,” USGS geophysicist Julie Dutton told CBS Houston, adding they have seen aftershocks in the magnitude 5.0 range since the initial quake. The Pacific Tsunami Warning Center says there is no tsunami threat for the region. Reuters reports that buildings shook and people fled into the streets in Mexico City. Mexico City Mayor Marcelo Ebrard took to Twitter to say that “no serious damage” has been reported in the schools and that there is no visible damage from an aerial view. There are no immediate reports of injuries or deaths. There is no information whether she was the former resident of Namie-machi, but I think it is likely. At 11AM on March 20, there was a 119 call [equivalent of the US 911 call, for ambulance for medical emergency] that a woman in her 50s collapsed in Namie-machi in Fukushima Prefecture. Namie-machi is designated as "no-entry zone". The woman entered with a permit to remove heavy equipment out of the zone. She was transported in an ambulance to a hospital in Minami Soma City, but confirmed dead at 1PM. According to the local headquarters for the nuclear emergency response, it is the first time someone other than the plant workers died inside the no-entry zone. According to the headquarters, the woman entered the zone with her colleagues with a permit issued to businesses. She suddenly fell ill, and went to the bathroom, where she lost consciousness and collapsed. Why were they allowed to remove the equipment out of the no-entry zone to begin with? After more than one year, don't they and the government know there are such things as radiation contamination? Why would they allow a woman to enter the no-entry zone? Equal rights for women, I suppose. Since TEPCO is bringing female workers back to Fukushima I Nuke Plant, why not? Namie-machi had extremely high levels of radiation in the first 2 weeks of the accident, and the residents weren't told about it until months later. Asahi's "Trap of Prometheus" says the Ministry of Education was measuring the radiation level in Akogi District of Namie-machi on March 15, 2011, and it was 330 microsieverts/hour air radiation. That would be over 55 millisieverts in one week, and there were people who remained in Namie-machi for more than a week, lulled by then Cabinet Secretary Edano's word that "there is no immediate effect on health". Let's see, how would people like Dr. Yamashita and Dr. Kimura going to explain the death? She had a feminine stress. She had an autoimmune disease. She drank and smoked too much. Pure coincidence. There is no way that radiation affect anyone this fast. Contrary to what TEPCO's PR person told the reporters during the media tour of the plant in February, it has turned out that the video and audio copies of the teleconferences between the parties involved (Fukushima I Nuke Plant management, TEPCO HQ, the Japanese government) do exist. It has also turned out that the Kan administration officials may have instructed TEPCO to delete the audio portion of the contentious meeting in March last year between then-Prime Minister Kan and TEPCO officials where the prime minister threatened TEPCO not to withdraw from the plant. It has been revealed by the source involved that the Prime Minister's Office may have requested that part of the audio recording to be deleted during the teleconference when then-Prime Minister Naoto Kan visited the TEPCO headquarters on March 15 last year. Mr. Kan seemed possessed with the idea that TEPCO was planning to withdraw completely from Fukushima I Nuclear Power Plant, and was in a state of abnormal excitement. People accompanying Mr. Kan may have been worried that his remarks would be recorded verbatim. It may cause repercussions that part of the record of this historical accident has been lost this way. According to the investigation commission set up by the National Diet, there is a video of Mr. Kan scolding the TEPCO officials in the TEPCO's emergency response room on the 2nd floor of the TEPCO headquarters [in Tokyo]. But there is no audio to the video, and the commission has no way of knowing what Mr. Kan said. Personally, from what I've read from the interim report by the investigation committee set up by the Cabinet Office, I do not believe TEPCO intended to do so or that there was anything TEPCO could have done at that point (it took fire fighters to pour water from the fire engine booms to the spent fuel pools to lower the radiation levels somewhat). It looks like someone fed the excitable prime minister some incomplete information about TEPCO's intention. I do not know whether that was intentional or unintentional; it may be the case of "Chinese whispers" game. Asahi Shinbun reported that Takamasa Shimizu, then-President of TEPCO, was desperately trying to reach Minister of Economy Kaieda, not Kan, that day, after the radiation levels in the plant compound spiked to a lethal level. It has sure helped boost Kan's standing that he stood up against the villainous TEPCO. Asahi Shinbun's English web-based news Asia Japan Watch has an article that says Japan's Nuclear and Industrial Safety Agency, Nuclear Safety Commission said no to IAEA's proposal in 2005 to designate the area within the 300-kilometer radius from a nuclear plant as "an area where shipment bans on farm products and other measures would be implemented to regulate the intake of radioactive contaminated food". The 300-kilometer radius just about covers Shizuoka Prefecture, where radioactive cesium was detected in teas that exceeded the provisional safety limit. When the International Atomic Energy Agency in 2005 proposed defining a zone where food intake regulations were to be enacted in the event of a nuclear emergency, Tokyo objected. And the Vienna-based international nuclear watchdog never did define such a zone, leaving it up to the health ministry to hastily introduce regulations six years later following the accident at the Fukushima No. 1 nuclear power plant. Official documents disclosed at the request of The Asahi Shimbun said that the Japanese government filed an objection when the IAEA proposed to designate, ahead of a potential nuclear disaster, an area where shipment bans on farm products and other measures would be implemented to regulate the intake of radioactive contaminated food. The IAEA in February 2005 drew up a draft safety standard, which said that food intake regulations should be prepared within a 300-kilometer radius of a 1-gigawatt class nuclear power plant in case of a major accident. According to the documents, members of Japan's Nuclear and Industrial Safety Agency, the Nuclear Safety Commission (NSC) of Japan and the science and technology ministry in May 2005 discussed the proposal. Participants decided to request, in the name of the Japanese government, that the concrete distance figure for the proposed zone be deleted. The attendees cited the need to "consider negative publicity and other factors before defining a food regulation zone." They also said it was necessary to "consider whether it is appropriate to presume an accident with as big an impact as the one at Chernobyl," a report said. The Brazilian government also made a similar protest. The distance specification was deleted in the end. Until the Great East Japan Earthquake crippled the Fukushima No. 1 nuclear plant last March, the only disaster response guideline Tokyo had in place was for the disaster response headquarters to "begin considering" measures to regulate food intake. There would be "enough time" from the onset of an accident to the implementation of regulations on the intake of food, the authorities said at the time. Following the Fukushima disaster, the health ministry hastily came up with provisional safety regulations that may not have been far-reaching enough. "Following the latest accident, radioactive cesium exceeded the safety standard in tea leaves from Shizuoka Prefecture, more than 300 km from the Fukushima plant," said Hideaki Tsuzuku, the director of the Radiation Protection and Accident Management Division at the NSC. "Retrospectively, 300 km was not too large. We knew, from the Chernobyl experience, that radioactive substances below levels that are harmful to human bodies can be condensed in plants and domestic animals." The NSC, currently reviewing the disaster response guideline, plans to define numerical standards for radioactive substance levels at which food and beverage intake regulations should be enacted. We all know what happened last year. Instead of banning the shipment of agricultural products within the 300-kilometer radius from Fukushima I Nuke Plant, the government encouraged the production, encouraged the shipment, and encouraged people to buy the products to help support farmers. They sample-tested vegetables, one vegetable from one farm in one city, to assure people the entire shipment from the entire city was safe. Before designating the highly contaminated Iitate-mura and Namie-machi in Fukushima Prefecture as "planned evacuation zone", the government encouraged cattle farmers to sell their cattle quickly. And now, one year later, the Nuclear Safety Commission has the gall to say the 300 kilometer radius was not too big after all. The Ministry of the Environment has a 2-minute-long commercial featuring Minister Goshi Hosono, aka disaster debris pusher, in front of the mountains of disaster debris in Ishinomaki City in Miyagi Prefecture. Just about every single sentence he utters is short on facts and accuracy and full of misrepresentation. Hosono: As you can see, this is a huge mountain of debris. Fact: Debris is actually neatly piled up, because it has been removed from the immediate coastal areas hit by the tsunami and is being stored there, as you can see at 0:26 into the video. But the disaster debris wide-area processing is being sold on the perception that the tsunami debris is still littering the streets and people's backyards after one year. Hosono: Ishinomaki City cannot complete the disposal alone. Fact: In fact, the city can. The debris are being stored on the landfill on the bay, not bothering anyone nearby. The city has budgeted nearly 200 billion yen (US$2.4 billion) to do the debris disposal, building 5 new incineration plants on the landfill and in the process creating 1,250 jobs. 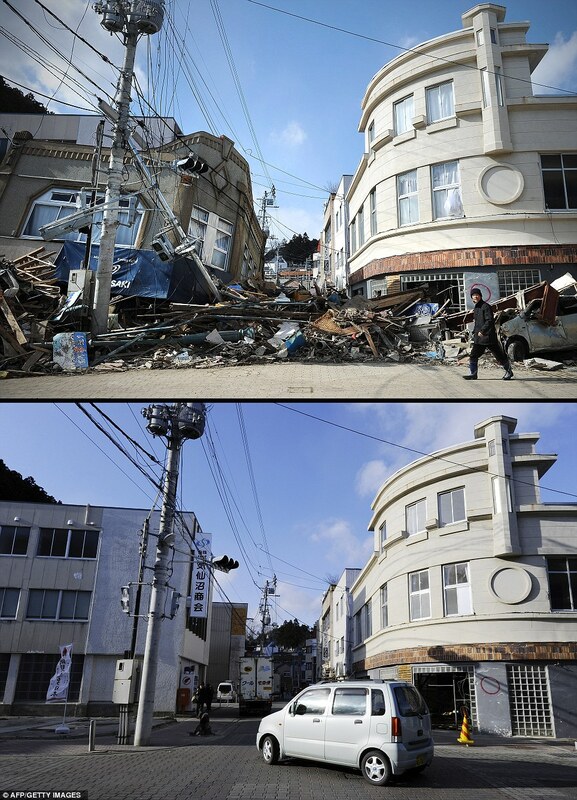 None of the sister cities of Ishinomaki City has been asked to take the debris. Hosono: The debris is the remnants of people's lives. Fact: Yes it is. So? Is that the reason to spread it all over Japan? Wouldn't the pieces of lives of people in Ishinomaki want to remain in Ishinomaki? Fact: The debris is on the landfill, removed from the areas where people live and work. It is not in front of them. Fact: Ishinomaki has 6 million tonnes of debris. Of that, 10 to 20% of the debris is what the Ministry of the Environment wants to spread to the rest of Japan because "Ishinomaki cannot do it alone". It doesn't add up. It may lengthen the time it takes to dispose of the debris by 20% at most. It may take 6 years instead of 5. Or 12 years instead of 10. It doesn't seem like such a vast difference. Fact: You cannot measure the contamination on the debris by a survey meter unless the contamination is in the order of tens of thousands of becquerels per kilogram. Fact: No one trusts the "safety" standards of the national government, particularly those set by the Ministry of the Environment. And the ultimate fact is that this wide-area disposal of the disaster debris was decided in May when the radiation contamination was thought (by the government) to be occurring in Fukushima Prefecture alone. Everything was set to go, with the heavy support from the big businesses, when radioactive materials started to be detected outside Fukushima. So what do you do when the situation changes? As far as the Japanese government goes (as with most governments in the world), keep pushing no matter what. Big money is at stake.